In a shocking turn of events that would surprise Nostradamus, the right wing tabloid press has been having a bit of a field day with what seems to be a non-story about Labour leader Jeremy Corbyn. With the subtlety of a sledgehammer, the Mail and their ilk have been driving home the message that Jeremy Corbyn is a communist spy – or at least was, during the latter-end of the Cold War. Their sources? One former Czech spy who, among other things, claimed to have started Live-Aid and that, through Corbyn, knew “what Thatcher would have for breakfast, lunch and dinner, and what she would wear the next day.” And yet the tabloids continue to persist with the brand of “just-not-libel” they have perfected. The Telegraph at least had the decency to still be taking the claims with a pinch of salt, although as always the opinion pages are somewhat teeming with an abysmal blend of primal anger and unbridled joy at the existence of anything that might be used to smear whatever they decide is too left leaning. Matt, the cartoonist, however has managed to succinctly sum up the story in his cartoon – a whole load of nothing. I don’t have a problem with people being interested in Corbyn meeting with what he apparently thought was a Czech diplomat in the 80’s. Given this was during one of the most paranoid times in history (can you imagine the horror of a Cold War in the internet age? All the propaganda, dodgy money and legions of angry idiots duped by competing extreme ideologues and wealthy shadowy figures…oh, never mind) and as Corbyn is trying to become prime minister, it is right to question this meeting. Of course, there likely isn’t much to find, given Corbyn had barely started his career in Parliament, was in opposition, and had as much access to classified information as I currently do. 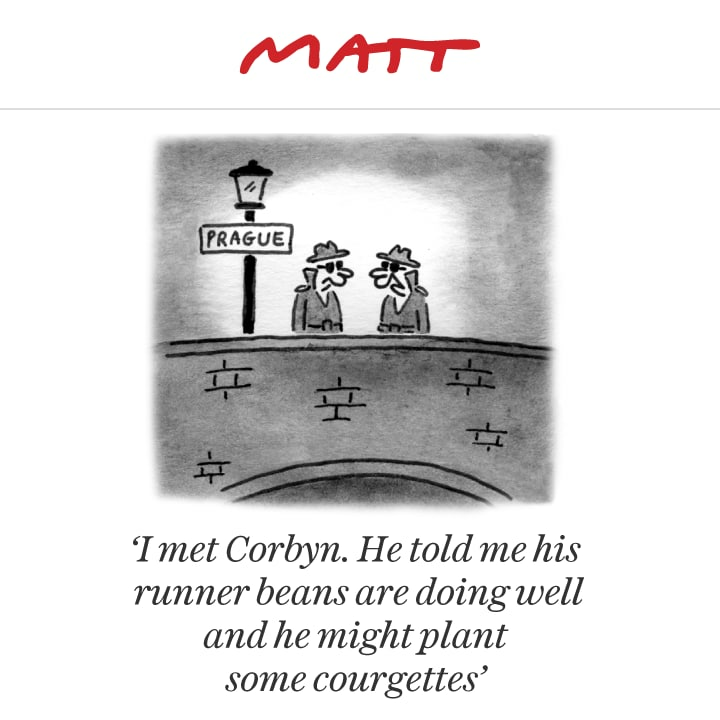 As far as Corbyn was aware, he was meeting a diplomat in the House of Commons – hardly the most surreptitious of places to share state secrets he had no access to. He mostly seems to have badmouthed the U.S and the Tory government – hardly a radical departure from his current shtick. The press also seems to have forgotten the most brazen MP-turned-spy was a Tory MP, but the reds-under-the-bed narrative has to be maintained at all costs. The real problem with this story is the sheer hypocrisy of it all. After all, just a few short weeks ago the darling of the reactionary right Jacob Rees-Mogg met with Steve Bannon, a man who is very much a threat to our democracy. After this meeting, Rees-Mogg decided to spread histrionic claims hidden as calm concerns about the integrity of the Civil Service, because they aren’t able to do the impossible and make an ideologically-pure Brexit happen without serious damage to the country. This could have been a coincidence, or it might not. Bannon has openly called himself a Leninist who wants to destroy the state, and presumably his ambitions haven’t ended with his foray into tricking Americas most gullible. Despite his thesaurus-fuelled vernacular and possessing the calm sense of authority one can only achieve by going far in life despite having no discernible qualities or talents, Mogg is not the brightest bulb in a fairly dim UK political scene. It’s easy to see how quickly he could slip into “useful idiot” mode, unable to resist pontification on ideas that he knows very little about and a seemingly rapt audience. We see this streak in other leading Tory party members, notably our former Mayor of London and current Embarrassment of the Nation Boris Johnson, who also only narrowly avoided accidentally meeting Russian stooges – a fate Corbyn couldn’t escape 30 years ago. So why aren’t the right wing press questioning the links between Russia and Jacob Rees-Mogg, or their other darling, former UKIP leader and occasional Donald Trump bidet, Nigel Farage. There is plenty of evidence linking both to dodgy Russian money and suspicious Twitter supporters (most likely bots designed to spread misinformation and seeds of disharmony) to both men and their current demonic Brexit baby. Farage especially has been meeting some dubious characters as of late, some of whom have a clear vendetta against Western governments and the power to do something about it. It just seems strange that these papers are obsessed with a meeting that happened thirty years ago, but want to ignore something similar happening now. I don’t expect anything other than rabid hypocrisy from the tabloids, but frankly the rest of us should be kicking up more of a fuss about this sort of thing. Farage isn’t that important, given now he’s basically a washed up ideologue begging for relevance. Mogg, however, is a favourite among the ever esoteric and ageing Conservative Party members, and within the tabloid press, who seem keen to regress to Victorian standard values and rights in as depressing a way as possible. There is a number of things we can do about this. You can write to your MP and question the links between nefarious money in our politics and the rise of counter-culture movements that are steeped in fictitious online activity. Complain when prominent MPs meet people who are clearly opposed to our democracy (as shaky and loaded as it is). Don’t automatically ignore or block those who are spreading blatant falsehoods or clearly pushing a narrative (even if it’s one you agree with): learn how to spot bots and report them. Increasingly, the only way to hold these people to account is to make as much noise as possible – and it will only work when we’re all making a din.